I love having people over for dinner because it allows me to indulge in all my chef fantasies. One such fantasy is serving multiple course dinners (3+ courses), which for many practical reasons I never really do. It's an exciting challenge to pick complementary recipes, put them in sequence, and then figure out how to pull off all of the cooking so I can get the food out in a timely fashion (and enjoy the company of friends). I've learned not to be too overly ambitious in recipe choices, and definitely not to try a recipe for the first time during one of these dinners. Good prep work and mise en place is absolutely essential, so any cooking that needs to be done in between courses can be done in a neat and efficient manner. Most important for me is to make a time line of events and follow it closely, this way there is no forgetting to do things like preheat the oven, or start cooking the rice, which can really throw you off your game. Soup is a great thing to serve during a dinner like this because it can be made in advance and reheated. This particular soup I had made many times before, and it is always a hit (it's always nice to have a ringer on the team). 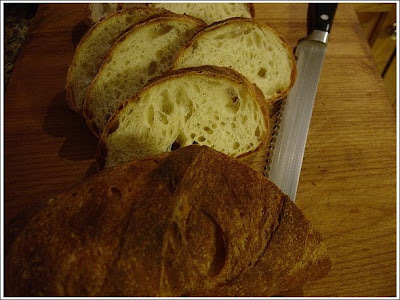 Good homemade bread is always a standout as well. My third course was a little unwieldy thanks to my choice of risotto (which I cooked part way in advance - an ongoing experiment of mine) and a rather labor intensive (but very good) chicken recipe (this one's not free) from Cook's Illustrated. 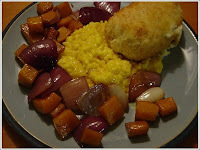 I will definitely make the chicken again, but probably as a standalone dinner, not as a course in a larger meal. The real standout recipe to me in this bunch was the salad. I was vaguely aware of the concept of a spinach salad with a warm bacon dressing, but I'd never had it before. Somehow this was the first idea that popped into my head when I went about planning this particular menu, so I first had to find a recipe that sounded good to me and test it out. 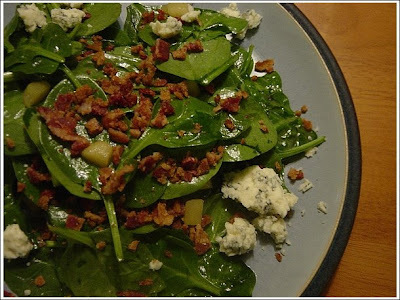 The basic idea is to make a warm dressing utilizing a little fat from some bacon, then pour the hot dressing over the spinach to wilt it a bit before serving. I thought this particular salad made a perfect first course - something slightly out of the ordinary (although apparently it is a classic American recipe), very good, and relatively simple to prepare. I'll definitely be throwing this one into the fancy dinner rotation. As a quick aside, let me just say that I don't think there's any better way to spend an evening than at somebody's house, with good food, good wine, and close friends.